A joint event with the Global History and Culture Centre, and the European History Research Centre. This one-day workshop will explore the history of public office in Britain and its eastern empire, from the sixteenth to the end of the nineteenth centuries. The aim is to examine how, why and in what ways notions of public office evolved over time and space, and relate these to ideas about corruption, state formation, and values such as integrity, impartiality and the public interest. Besides papers from historians with expertise in different periods and types of public office, there will also be contributions from a sociologist, an anthropologist and a legal scholar. Please follow the link above or here for the draft Programme. We are aware that this is scheduled for a day on which there could be strike action. However, we are planning to go ahead with the workshop because two US speakers have already booked flights and the chances of rearranging the event for another time with the same team are zero. We also hope that the dispute might have been resolved by the time of the workshop!! Registration is essential. Refreshments and lunch are included. There is a small charge of £20 to cover costs. The workshop is free for students and Early Career Fellows who are unfunded. 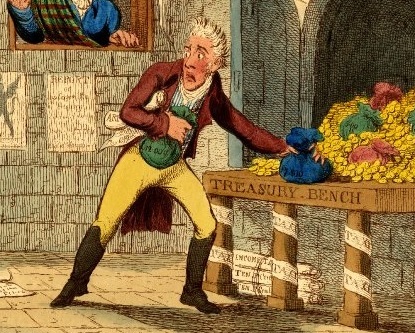 A detail from 8th commandment- thou shalt not- Steele (1807) satirising Thomas Steele, paymaster-general, who was accused of embezzling two sums of £7,000 and £12,000 from the cash in his hands and for which he gave his own receipt! © Trustees of the British Museum.